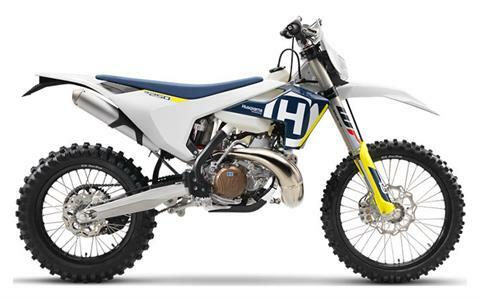 The TE 250 takes the simple, low-maintenance motor concept that is a proven favourite of enduro riders, and progresses it with modern technological advancements. The engine shaft arrangements ensure excellent mass centralisation while a counter-balancer shaft reduces vibration. The electric starter unit is located within the engine casings, keeping it secure from impacts and is linked to a lightweight and powerful Li- Ion battery for reliable starting when needed most. ENGINE: The 250 cc 2-stroke engine has for long been the best combination of unsurpassed power and lightweight construction. The simplicity and low maintenance cost of the 2-stroke motor has made it a favourite amongst enduro riders for generations. The TE 250 engine has an advanced construction featuring shaft arrangements precisely positioned for better mass centralisation, a counter balancer shaft reducing vibration, a twin-valve controlled power valve and 6-speed enduro gearbox. NEW WP REAR SHOCK: The WP DCC rear shock is designed to provide advanced damping characteristics while keeping to a compact and lightweight design. With a pressure balance inside the shock, the stroke is more seamless resulting in greater rider comfort and handling while the corrugated outer contour of the reservoir improves cooling.